What Portable Radio Did you start your listening hobby with? We often get new visitors interested in the hobby, they'd love to participate but don't know where to start. Note: Looks like you'll need to add a "reply" to comment on your choice of radios, I didn't realize this when creating the poll itself. I thought this poll would be a great way of indexing our 'gateway drug' to this hobby. If your favorite starter radio had one outstanding feature that made you choose it, please mention this as well, and perhaps as later novice listeners come along, we can later point them to this list, for low-cost entry level radios to start the hobby in. I left the poll open to 3 votes, for those of us who started out with a mix of radios until we found the one we really like. Feel free to wax fondly how/what you first heard, homebrew antenna tips, but keep in mind the shoestring budget most beginners start with. QTH: Now DXing from Al Stern's backyard. Re: What Radio Did you start your listening hobby with? I got started with a small portable that my Dad had. With a whip antenna, I was able to pick up 90 meter stations from Guatemala, so it wasn't a bad radio. Of course we had so much less QRM on the bands back then (this was 1978). I've got two portables, a Sony 7600G and a Sony ICF-10, but neither sees much use. I started with the proverbial "Multiband" or as I like to call them, "Muttli-band" Shortwave. I think mine was Branded "Gran Prix" but was slightly better built than later audio drugstore-shelf electronics that were associated with that brand. I was 15 and pretty sure I inadvertantly snapped the whip off it it pretty quickly, and resorted to speaker wire, strung out the window. I could hear the BBC, RHN and pretty much V2 even though it didn't have SSB, in South Florida V2 splattered everywhere. My first serious radio was the DX-440, and then the Dx-398 ...and learning how to deal with the BFO knob and make out weak usb stations. Pirates on portables were elusive for me until I moved up to the mainland, and got lucky with occasional skip. My first radio (portable) was a Motorola transistor radio. 1972. Heard a pile of foreign DX with it even though I never had any idea of what freq it was tuned to. I then got a Hammarlund HQ-110A. Warm, wide audio. After that I drifted away from the hobby for a long time. Got back into it with a Kenwood R-1000 in the early '80's when I was a pirate, then got out of it again. Back into it with a vengeance in the very late '90's. Various high end receivers; ITT/McKay 3021A (fan-freakin' tastic rig!) 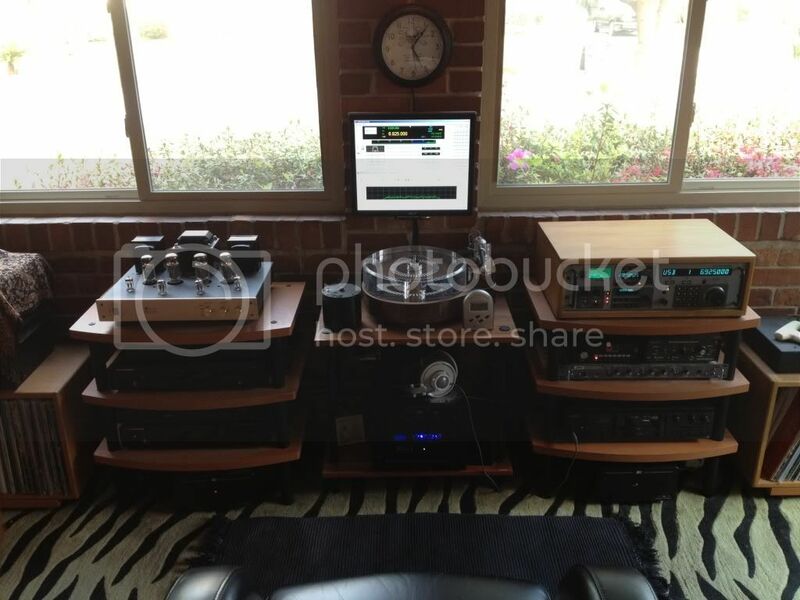 , JRC NRD 525, and an actual TON of tube sets: RCA AR-88's at 110 pounds each, (best audio EVER!) Hammarlund HQ-170, Hallicrafters SX-111, SX-24, S-20R etc and etc. Mostly I just listen on my Kenwood TS-480SAT ham set now but it doesn't have the charm. I have a Flex 1500 waiting to be loaded but have not tried it yet. My first SW radio was a generic Hong Kong multiband radio that my uncle threw in the trash because the antenna had broken off. Connected some speaker wire and it worked OK. I used bungy cords to secure it to the handle bars on my bike. Rode around the neighborhood and listened to the major SW broadcasters and VHF fire/police. Years later, my college roommates threw it from a 6th floor window during a party. I started out with a couple of builds when I was a kid, a Knight Space Spanner followed by a Star Roamer. I finally saved enough coin to buy a Drake SW4A which was receiver enough to hear most of the English stuff. After a hiatus during college, my first purchase after graduation was an R7, which forced me to go without a car for a while, but priorities are priorities. Got an R8 when the R7 started getting tired. Also had a number of boat anchors along the way, including an HQ-180 which I used for a while, primarily in winter. Just acquired an SDR-IQ after lusting over all the screen shots many of you have provided. Only advice for newcomers is to initially buy all the receiver you can afford after careful reviews of reviews, but don't get all freaked out about it. Nobody, even with the very best high end receiver, can hear everything. But there is always something interesting to be heard, based on your location, and take some time to figure out what it is that you like. If you're normal (or abnormal) like everyone else in this hobby, you are going to grow through a succession of receivers; just plan on it, and have fun! "Other": I'm pretty sure it was a Radio Shack 12-795. Multi-band job with the needle that went back and forth over the band displays. Took a bunch of D or C cells. I really miss that crappy thing now that I think about it. My trip into sw began at age 11, when my father decided to get into ham radio (he had a radio technician license, so they just gave him a ham ticket). Being the frugal type, he purchased numerous boat anchors, and I took to listening to one (cannot remember the name). For some reason, even with the volume on bust, I still had to literally put my ear on the speaker in the top to hear the signals. After a couple weeks of this I figured they were worried about me becoming permanently deformed, and my father came home one day from an estate sale with a beautiful HQ-180! This wonderful radio lasted me until my 16th birthday, when I got a shiny new Yaesu FRG-7 that still sits on my desk today, over 30 years later. My primary receiver is now a JRC NRD-525 (which I love), but I still use the FRG-7 as a second rx. When I was about nine, I hacked a Coleco "CB-40" and discovered an entire world outside the CB range it received. A Radio Shack DX-60 was my first "real" radio and I had used every one of their line on up to the DX-302. I currently have en Eton E5 as my main radio and an Allied SX-190 standby and a pile of Heath waiting refurbish. My first receiver was a Radio Shack DX-100 given to me by my grandfather followed by a DX-200 later. I used a Radio Shack CB 5/8 vertical which actually worked pretty good; in fact it was the best antenna to hear Radio Tahiti on. Eventually using the DX-200, I came across William Cooper's 'The Hour Of Time' and was hooked on the fringe element that shortwave offered. In the early 90's, I bought a Satellit 500 and discovered pirates which screwed me for life as an addiction with purchasing more equipment, investing untold hours and believing I could always outfox the ionosphere to hear more shows I also had a Drake R8A through the later part of the 90's and then foolishly sold it to get my TT (as much as I like my Ten Tec, I have a soft spot for the Drake R8* series). Aside from receivers, the antenna part of the hobby can be rewarding for those who like to experiment with different designs. Even though I now use an off the shelf active system, the EWE antenna I had for a few years was one of the cheapest and best performing antennas I ever had. The first station I ever heard on shortwave was Deutsche Welle's IS & the first pirate I ever logged was WSKY . My first shortwave portable, probably around 1990, was a no-name little thing that worked well enough for the major AM broadcasters. I was encouraged enough to quickly replace it with a Radio Shack DX-440 (Sangean ATS-803A), which offered sideband capability and was overall a much better radio. It would still be good enough for me today. I'm limited more by apartment restrictions and the usual suburban RFI than by the receiver or antenna. I added one of those roll-up reel antennas that clipped onto the whip. That worked pretty well outdoors. Indoors I just strung up some magnet wire around the perimeter of the ceiling to make a short dipole, which worked pretty well back then. Just 20 years ago RFI wasn't nearly as bad around apartments and suburbs. I suspect the main culprit now is the proliferation of imported consumer electronics and other products that don't come anywhere close to meeting FCC regulations for shielding. The DX-440 served me well until I replaced it with a Sony ICF-2010 I found at a pawn shop for around $75 in the late 1990s. I sold the DX-440, but it'd still be a good 'un today. A decent mid-priced portable with digital tuner and sideband capability is probably the best bet for city residents or suburban apartment dwellers. In many cases the best way to improve reception is to get about 20 yards away from the nearest building or utility lines. Easily done with a portable. Occasionally I'll tote a small portable with me on walks and often get better reception than I get at home with the Palstar and some random wire up a tree - again, because RFI drops off significantly just 10-20 yards away from buildings or power lines. As for antennas, I've been experimenting recently with the Villard shortwave enhancer loops and one in particular works surprisingly well, costs next to nothing and doesn't even require a separate tuning capacitor. It's just aluminum foil on foam core backing board, and the aluminum foil overlap *is* the tuning capacitor. It's remarkably directional even above 10 MHz, which was quite a surprise. And it seems to work best with small portables. I'll post an illustrated article about it soon, along with a video demonstrating it in use. an internal ferrite loop built listening from Groton, Connecticut that was enough. way or that so my first directional SWL antenna was also in the Silvertone. radio as I was licensed in 1962. This is a mod- thought it best to recall that I built a Heathkit "Ocean Hopper"
and found out pretty quick that the "antenna tuning capacitor" was at high voltage! at the proper threshold. But watch out for the high voltage! Good Lord I'm getting old!!! Good thoughts everyone... its fun to use the wayback machine once in awhile. Radio Shack DX-350 portable multi-band receiver. The thing was deaf as a freaking post, and it's a wonder that it didn't kill my interest in radio altogether. On an exceptionally good night, it might have received one of the religious super-stations, possibly an international news broadcast, and maybe a single-letter beacon or two. I guess I'm a slow learner or something, because I kept reading stories and reports of what was out there to be heard, despite not actually being able to hear them on that little plastic brick, and I eventually got a better radio (which actually _could_ receive signals). The Yaesu FRG-100 was my next foray into radio, and it heard a pretty good assortment of things. Its biggest failing was in the design; lacking a keypad, or anything other than the knob and a couple of buttons for frequency selection, traversing the bands took a while. There was software out there that could control it, but I could never find/afford it, and my computer at the time threw off so much RFI that I'd never be able to use the two of them together anyway. It wasn't until I upgraded to an actual HF transceiver that I really became able to listen to the bands with any real ease. My IC-718 remains my rig of choice for listening, and if I want to transmit, I just punch in a frequency, tune it up, and go. In between the DX-350 and the FRG-100, I read an article on modifying a Radio Shack AM Flavoradio for shortwave reception, by replacing the ferrite loopstick with a multi-tapped coil. That little flavoradio conversion had exceptionally touchy tuning, but by cranking the switch and finessing the tuning knob, it actually picked up a better selection than the DX-350 ever did. I was exposed to and used a few SW receivers before I owned one (the first I ever used was a Hallicrafters SX-28, and one is in my collection today), and I scratch built two receivers before I got my first that was "mine" and made in a factory. 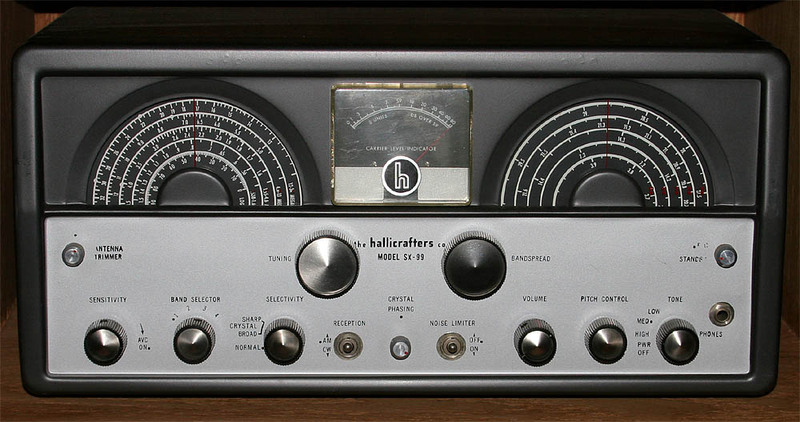 And the first one I got (in the late 60's) was a Hallicrafters SX-99. I still have that receiver today ( http://www.pbase.com/token/image/64201077/original.jpg ). I think my next was a Hammarlund HQ-145X, but I really am not sure (I have an HQ-145X today, but not the exact same radio, that was traded off long ago). I would be very hard pressed to name all of the receivers I have owned over the years, the list would run to easily more than a hundred models. Shoot, just the ones I own today probably runs to 75 or more, I really don’t want to add them up. For those that remember their first SW receiver…do you remember the first thing you heard on it? The first thing I remember tuning to with my “new” SX-99 (it was about 11 or 12 years old when I got it, 1956 or 1957 production date) was Radio Prague. Not on purpose, just turned the radio on and spun the dial, ending up on RPI. From that day for the next 15 years or so I was a regular Radio Prague and Radio Moscow listener. The very different spin from what I was getting from US sources was intriguing to me. And the fact that Moscow was the more moderate of Eastern block transmissions during the 70’s was interesting. Almost as if they wanted to sound as the voice of reason while they left other block partners to be the radicals. I started with a Multi-Band 'AirCastle' Radio sometime in the 1970s. I had a longwire antenna outback, and could hear all kinds of "amazing' things on it. One of my more memorable ones, was 4VEH in Haiti, running 7.5kW on 9770 khz. Later on I spent a whopping 160 bucks for a brand spankin new Realistic DX-160, I used that up into the 90's. Its amazing to remember how crowded the SW bands were back then, not so much these days.